Problems With Your Gate Intercom? 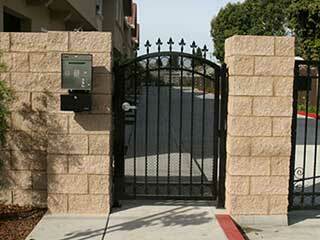 Call Us At Gate Repair Beverly Hills! Being able to talk to people who arrive at your gate and choose whether or not to admit them without having to leave the safety and comfort of your home is a major convenience. That's what an intercom system can allow you to do. It will help you get the most out of your automatic gate, but only if it’s working properly. Fortunately, our team is well versed in intercom repair, and can fix any malfunction that may arise. If you use a wired system, the chord connecting each end of the system can be all too easily damaged or stripped, especially if it covers a considerable distance. Wireless systems are less vulnerable in that sense, but can be subjected to local signal interference and transmitter damage. Like any device left outside, your gate intercom node is also vulnerable to damage from the elements, not the least of which are rain, dirt, and insects. If your system isn’t working, our experienced technicians will have no trouble finding the problem and offering you a solution. Usually, fixing a problem with this system is as simple as reconnecting some wires or replacing the circuit board, but our team can also provide a full intercom replacement if the need arises. Our company has a wide selection of products to offer you, with all sorts of added features that can make using your driveway gate all the more convenient and secure. Your intercom system should be hooded to protect it from the weather effects, and sealed to keep dust and other tiny debris away from the device's internal components. Our team can repair damage to the housing unit to ensure the electrical wires stay insulated and protected from small pests that might be interested in the wire insulation and speakers. In modern times, phone entry systems can do much more than transmit sound and allow you to communicate with visitors. If you’d like video capability, smart controls, or DECT features that will let you connect the intercom to your landline phone, our team will be happy to help you set it up and advise you on the best ways to enhance your system. Don’t live without a functional gate intercom system for longer than you have to. Get in touch with our team here at Gate Repair Beverly Hills and our technicians will fix whatever's wrong with your current system, or install a brand new one for you.